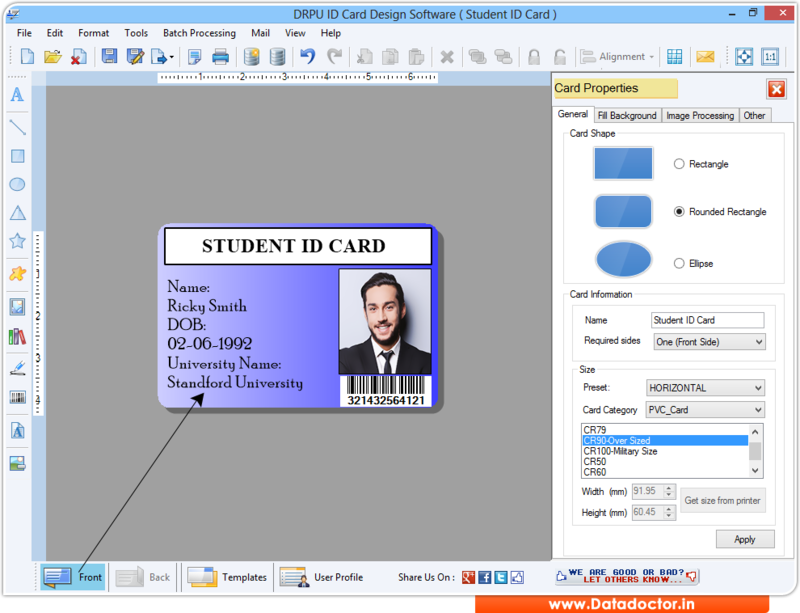 ID Card Designing software design and print various types of identity cards for employees, students, faculty and other people. Software provides advance image designing tools to create and print high quality ID cards as per specific needs and requirement. Generate multiple ID cards with different barcode and text value using batch processing series option. Software enables users to print multiple ID cards simultaneously using inbuilt print settings option. » ID card maker and label designing software easily designs business cards and labels of different colors and sizes use standard label designing facility. » Business ID card maker and label designing program easily creates business cards and labels by the help of various images creating tools or objects like text, pencil etc. » Design and create labels and cards using image designing tools including Line, Ellipse, Pencil, Rectangle, Text, Barcode, Picture, Arc, Triangle and Star objects. » Option to create label with specific type of fold including Quarter Fold (Side Flip), Quarter Fold (Top Flip), Half Fold (Side Flip), Half Fold (Top Flip), Postcard (No Fold). » ID card and label mkaer designing program print created labels using advance print settings.